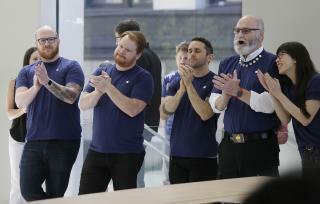 (Newser) – Thieves have stolen more than $55,000 worth of iPhones from New York City Apple Stores over the past four months by dressing as employees. The New York Post reports it started in February when a woman dressed like an Apple employee grabbed eight iPhones from an Apple Store on the Upper West Side. A male accomplice distracted the store's actual employees while another acted as a lookout. The same store was hit again in March. This time a man dressed as an employee grabbed 59 iPhones out of a drawer at the Genius Bar and had a female accomplice transfer them to a duffel bag in the bathroom while a male accomplice acted as a lookout. The total value of the iPhones stolen in both thefts was $49,300. Do what I do, work for a company that supplies us with Samsung phones. Don't ever have to walk into an Apple store and be accosted by thieving thieves. No doubt more corrupters working for Forrest T and his merry band of republicons.